Use our city navigation guide to plan your travel itinerary. 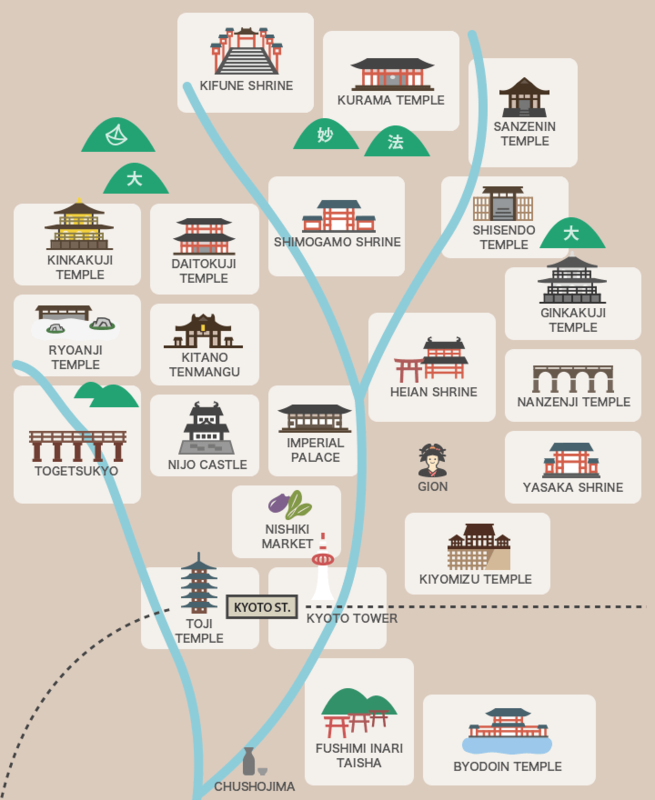 Choose your destination and look up the most convenient way of getting there from Kyoto Station! Take Kyoto City Subway Karasuma Line till the last stop. Then take Kyoto Bus #52 and change the bus at Kibuneguchi Eki Mae to #33. Take Kyoto City Subway Karasuma Line till the last stop, and then take Kyoto Bus to Kurama. The bus comes every 30 minutes in the daytime. Take Kyoto City Bus and get off at Ohara bus stop. It must be a day trip! The buses to Ohara where Sanzen-in Temple is located depart every 20 minute. Take Subway Karasuma Line to Kitaoji Station. You’ll find taxis soon! Easier and cheaper but it takes about an hour. It may take more time in high seasons! You should go up a hill to get to Kinkaku-ji Temple so taking taxi is the easiest way for your body. Take Kyoto City Bus #205 or #206 and get off at Daitokuji Mae bus stop. Daitokuji Temple is located a little far from town area so it’s better to visit some other spots around there. Take Kyoto City Bus #205 then get off at Shimogamo Jinja Mae. The buses depart every 10 minutes! There are no drivers who don’t know where Shimogamo Shrine is located. You had better show your driver some maps because Shisendo Temple is not so popular. Ichijoji area where Shisendo Temple is located has been included in the flat fare route from 2016. Kyoto City Bus #100 runs via Kiyomizu-michi which takes you to Kiyomizu Temple. So the buses might get crowded in the day time. Taking taxis is the easiest way to get to Ginkakuji Temp They take you to the entrance. After getting off at Imadegawa Station on Subway Karasuma Line, take Kyoto City Bus #59 and get off at Ryoanji Mae bus stop. The buses will get crowded in high seasons so taking taxi is the better way to move in Kyoto. Kyoto City Bus #101 comes every 15 minutes. When you leave Kitano Tenmangu Shrine, it’s easy to catch a taxi in front of the gate. Traffic is busy, so we recommend that you go through the alleys. If you take the main road, please be careful with vehicles. Kyoto City Bus #100 goes to the north along Kamo River. You’ll find such nice scenery. Riding bicycle is the most suitable way to go around Okazaki Park where Heian Shrine is located. It is the fastest way to go to Heian Shrine! Kyoto City Bus #5 takes you to the nearest bus stop. It departs every 10 minute in the day time. Full of natural scenery around Nanzen-ji Temple so it’s really refreshing to go around by bicycle! Take JR Sagano Line and get off at to Saga-Arashiyama Station. Kyoto City Bus #28 comes every 15 minutes. Kyoto City Bus #101 will take you to Nijo Castle. The easiest and the fastest way to get to Nijo Castle! TakeKyoto City Subway Karasuma Line and get off at Karasuma Oike station. Then change the train to Subway Tozai Line and get off at Nijo Station. Take Kyoto City Subway Karasuma Line to Marutamachi Station. Just go straight Karasuma Street to the north. You can go around and park your bike in the garden Kyoto Imperial Palace. If it’s a hot day, taking a taxis is the best way. Kyoto City Bus #206 departs every 15 minutes from Kyoto Station. Get off at Gion bus stop. The time above is the shortest one if the road isn’t crowded. There are some useful bicycle parking lots near Yasaka Shrine. Only 2 stops away from Kyoto Station by taking Subway Karasuma Line. The nearest to exit is #16. Tell your driver “I want to get to Takakura entrance of Nishiki Market!”. It is the best start to stroll in the market. It’s just a reference. If you are in rush, we don’t recommend it because there are many interesting things on your way. Take Kyoto City Bus #206 and get off at Gojozaka stop. Then walk up some slopes to east for 10 minutes. We can’t get to the front gate of this temple by any vehicles. There are many slopes and on the road to Kiyomizu Temple. Far from Kyoto Station on foot but it’s not an unreasonable distance if you love to stroll. Let’s take Chawan-zaka route! It’s like a heaven of potteries. The easiest way to go to Toji Temple from Kyoto Station. Not so far to walk. We recommend that you go via Fushimi Inari Otabisho. That shrine is a branch of Fushimi Inari Shrine! If you love trains, it’s a chance to get Kintetsu trains in Kyoto! You’ll find Kyoto Tower at once when you exit Karasuma entrance of Kyoto Station. Take JR Nara Line and get off at Inari Station. Be careful that the rapid trains don’t stop at the station, so be sure to catch the local trains! There is not much to see on the way to Fushimi Inari Shrine.If your goal of the day is visiting here, catch a taxi! The buses to the shrine come every 30 minutes. Take Miyakoji rapid train of JR Nara Line. If you take local train, it takes twice as much. There are some old and nice temples around Byodoin Temple.Visit on the same day!